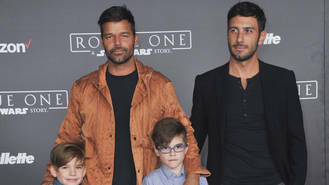 The Livin' La Vida Loca hitmaker and his new fiance, Jwan Yosef, headed to the California themepark for a little festive family time with Ricky's eight-year-old twins Matteo and Valentino, and they met up with Mickey Mouse, who was dressed as Santa. The foursome got into the holiday spirit by donning matching Santa hats to pose with Mickey in front of a Christmas tree, while they also got silly for a more relaxed snap, with Ricky, Jwan, and one of the boys all pulling funny faces for the camera, as the other twin looks on, unimpressed. This Christmas (Dec16) will be Ricky's first with his fiance after popping the question to the Syrian-Swedish artist last month (Nov16). The couple began dating in early 2016 after striking up a friendship more than a year before, when Ricky started collecting Jwan's work. Ricky shared the news of his engagement in an interview on America's The Ellen DeGeneres Show, during which he admitted he was a ball of nerves before proposing. The singer has yet to reveal when their nuptials will take place, but he has an idea how raucous it will be. "This is going to be Middle Eastern and Latin crazy all at once," he previously told People.com. "It's going to be one loud wedding!"